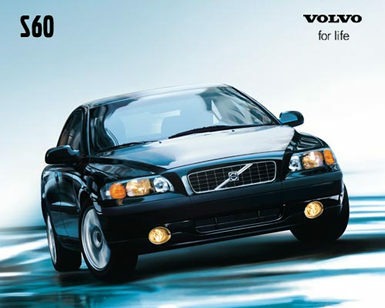 SAN FRANCISCO: In 2001, Volvo introduced its all-new S60 mid-range series. The 2.4T AWD version  AWD for "All-Wheel-Drive" was added for 2002. The S60 series has the new Volvo "look" with a coupe-like roofline replacing Volvos famous boxy styling. Volvos have always had that "last forever" feeling and the S60 is no exception. The S60 AWD system operates almost entirely in front-drive mode under most driving situations. When the road gets slippery, power is immediately transmitted to the rear-wheels as well for additional traction. The three other S60 versions have front-wheel drive and all four have a traction and stability control system. A more sophisticated anti-skid, "Dynamic Stability and Control System" is available as an option on all except the base 2.4 models. All S60s are powered by an in-line five-cylinder engine that features dual-overhead- camshafts (DOHC) and variable valve timing. The base 2.4 uses a 2.4 liter version of the engine that produces 168-horsepower at 5900 rpm and 170 ft-lbs of torque at 4500 rpm. The 2.4T and 2.4T AWD adds a light-pressure turbocharger to the 2.4-liter engine to increase output to 197-horsepower at 5000 rpm. The performance-oriented T5 has a slightly smaller displacement of 2.3-liters with a higher performance turbocharger to obtain 247-horsepower at 5200 rpm and 243 ft-lbs at 5200 rpm. The 2.4 and T5 can be ordered with either a standard five-speed manual transmission or optional five-speed overdrive automatic transmission. The Geartronic automatic can be used as a clutch-less manual. The 2.4T and 2.4T AWD comes only with the automatic transmission and AWD does cost a couple of mpgs. The fuel tank holds 18.5 gallons. When appropriately equipped, the S60s including the 2.4T AWD can tow up to 3300 pounds. Volvos have earned a well-deserved reputation for being safe, dependable and durable. As expected, the Volvo S60 is filled with safety features such as the Side Impact Protection System that includes front passenger airbags, improved seat belt pre-tensioners and dual side-impact airbags. There is also a Whiplash Protection System (WHIPS) and inflatable head curtain airbags. Anti-lock brakes are standard on all models. While relatively small on the outside, the S60 is very spacious inside and the 2.4T was a pleasure to drive. Visibility out the front is excellent, but rearward vision is not that great because of the sloping rear window. Not helping are the very tall headrests that are designed to protect heads and necks in accidents. Surprisingly, the sloping roof does not cut into the rear passenger headroom, but the rear legroom is on the skimpy side. The long, deep trunk will hold lots of stuff and if you need more capacity, the split rear seat can be folded down. The controls are large and easy to use with some radio controls also on the tilt and telescopic steering wheel. I particularly liked the innovative radio control that replaces the pushbutton for pre-selecting stations. Though Volvo calls the S60 a sport sedan, it is not really a serious contender to the likes of the Audi quartro all-wheel-drive models. However, road handling is competent and the ride is supple without any hardness, even on rougher roads. Steering is precise and firm, but the braking does have a bit of a mushy feel. Volvo like its Swedish competitor, Saab, has refined the turbocharged engine to perfection. Step on the throttle and the S60 accelerates rapidly without any hint of turbo lag. AWD eliminates any trace of torque steer often found on other front-drive cars with lots of power.